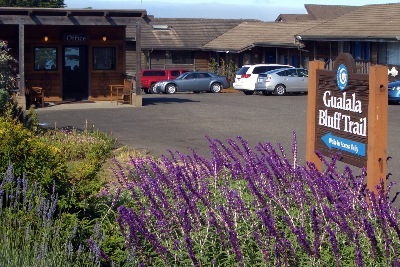 "The Pacific is calling, come restore your soul"
Welcome to the Surf, Gualala's first Ocean bluff lodging establishments on the northern coast of California. While this landmark motel was built in 1965 with only 14 rooms, it has evolved with expansions and upgrades to 20 guest rooms. The expansion created a Lobby and 3 Full Ocean View rooms, 1 Suite and 5 rooms with Full kitchens. Your hosts Eric and Caron Cogdill purchased the motel in January 2008 and have transformed it into the best value for your lodging dollar while traveling shoreline coast of hwy 1. This classic inn offers some of the most unique items to be found in Guest Rooms anywhere and rivals 3 diamond offerings in our area. All of our rooms offer the following as a minimum. 37 Inch Flat Screen television, Refrigerators and Microwaves. I-pod music station with wake up alarms, 24-7 Free Wireless Internet, 5 Inch Hypoallergenic Feathers Beds and Comforters. Direct TV with HBO channels, Direct Dial telephones with bathtubs/shower combinations. Each room is supplied with a Keurig coffee maker and ceramic coffee mugs. Your bath room amenties containers are recycleable. Each guest is exposed to what we call the " Yellow Towel Treatment", this must be experienced and cannot be explained. If you are traveling on a motorcycle we will have a white towel on your bike in the morning to clean your " Ride." Creative metal art work depicting ocean and marine life will enhance the feeling of being at the ocean. Our Wild flowers adorn the motel grounds with open spaces to allow you to breath in the views that our bluffs have to offer. A nightly tradition, Sunset. We have placed real Adirondack chairs on the bluff, come early and let nature do it's work. A Fire pit has been added to this area. Our facility is pet friendly, but we do charge a fee. In brief, see what others are saying on WWW.Tripadvisor.com and then create your own story. We will be the first to say that some of our guest rooms are small but all is forgotten as one of our past guest said " when I sank into the 5 inch feather bed I did not care." Call toll free 888-451-7873 or Direct dial us at 707-884-3571. You can send us an Email at Lodgingto@aol.com Our physical address: 39170 S. Hwy One, Gualala, 95445. Mailing address: P.O. Box 695, Gualala, CA 95445.